Anyway, I also need to install the body panels over the rear wheel, and replace the plastic panels over the handlebar. This last one is no small job with the instrument panel and switches requiring transfer. One of the reasons I love the Vespa is that it pushed me to do more wrenching on my own. I took auto shop in high school, and did basic things on my cars when I was younger. But as I started doing better as I got older, I relied on paying for all work on my vehicles. Even when I first got the Vespa, I relied on a local dealer at first. 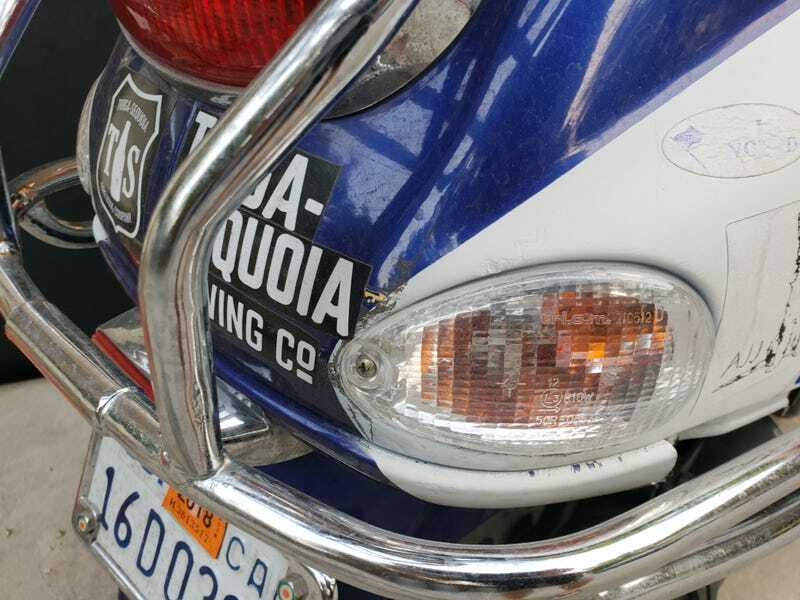 But shockingly, the dealer who relied on selling Vespas and Moto Guzzis in Fresno went under. No one locally would do anythimg beyond mounting tires on my little scooter. So I started doing things, and found that the little 1 cylinder engine that I wasn’t afraid to break gave me confidence to try more. I watched YouTube videos, and now do everything on the Vespa myself. I want this maintenance squared away so I can decide once and for all whether to do a body restoration on this scoot. My pal Dave wants to help me dand, repair, and paint, and he made me some cool wasp graphics. My son wants me to leave it ratty, with unpainted panels and tons of stickers. These are the trials of our times. I did not get this done yesterday because I blew it off to drive the Sunchaser with my wife. We went shopping, and I bought a fancy Lay-Z-Boy recliner. I will review it here when it arrives in mid-September.